6 February 2007. JMM gets a surprise visit from Philippine Idol’s Drae Ybanez and Miguel Mendoza late night while Canto Cinco practices for their Valentine’s concert at Megamall. Jerome Villadolid, Roma Escaner, Cynthia Sanchez, Marife Villaroman and I enjoyed the fans gathering of Reymond Sajor, Philippine Idol Finalist at the Sandbox, My Place in Katipunan. Reymond sang Panunumpa excellently during the affair. Philippine Idol’s Arms Cruz, Drae Ibanez and Markki Stroem who flew from Switzerland came to visit us at the Jesuit Music Ministry. 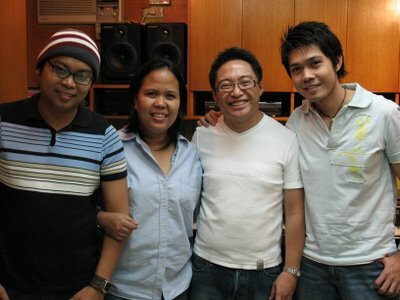 Early on, Raymond Sajor, was our guest at the office. Here are some pictures when they tried the Jescom, SFX Studio. Reymond Sajor of Philippine Idol, who sang incredibly and excellently well especially Martin Nievera’s “Be My Lady” and “Hindi Magbabago” visited JMM last Tuesday, 21 November 2006. He came with Oliver Oliveros, publicist, and Cynthia Sanchez, who does our orchestral pieces for concerts.